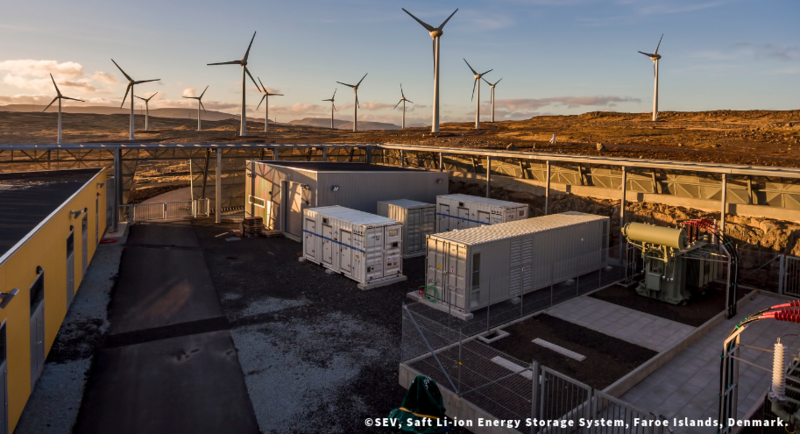 SEV, the Faroe Islands utility, has commissioned Europe’s first fully commercial Li-ion energy storage system (ESS) operating in combination with a wind farm. Saft’s containerised solution is helping to maintain grid stability so that the islanders can capture the full potential of their new 12 MW Húsahagi wind farm. SEV has a green vision for 100 percent renewable electricity production by 2030 by making full use of the Faroe Islands’ abundant wind and hydro energy resources, together with emerging technologies like photovoltaics and tidal energy. By 2030, SEV will double its current 314 GWh annual demand for electricity. The latest step in SEV’s renewable energy programme is a new 12 MW wind farm located in Húsahagi, on the island Streymoy. Since coming on line in 2014, the wind farm has increased the islands’ wind share to 26 percent of total electricity production. To overcome short-term variations linked to the variable nature of wind, lasting from seconds to minutes, a 2.3 MW Li-ion ESS has been deployed. It provides ramp control to smooth out sharp increases and decreases in power, as well as frequency response and voltage control services. The use of energy storage thereby helps to minimise curtailment of wind generators during periods of high wind and low consumption. The 2.3 MW ESS at the Húsahagi wind farm comprises two Saft Intensium® Max High Power containerised Li-ion batteries. They were delivered in standardised 20-foot containers for ease of transportation and installation. Along with the battery modules, they integrate the communications interface, battery management and cooling and fire prevention equipment. The batteries are combined with ENERCON’s power conversion and control equipment. The ESS is designed to limit short term power variations of the wind farm in order to maintain grid stability. Due to the high power capability of the ESS, only 700 kWh of storage capacity are needed for this operation which requires the equivalent of several full discharge cycles per day over an estimated lifetime exceeding 10 years. The Húsahagi ESS was commissioned in December 2015. Since then, it has reduced the variability of power flows at the grid connection point (up to 5MW/min) by a factor of 15 to 20. As a result, the standard deviation of the grid frequency is reduced by about 50%. Furthermore, curtailment is reduced as SEV can operate the plant in period of strong wind variations, which increases the energy production by 5GWh per year and saves 1000t of fuel. With SEV’s operational expertise in renewable energy allied to Saft’s leading-edge energy storage technology it is already making a significant contribution to enhancing grid stability.